As the summer of threes continue, another Pirates movie hits screens this weekend, that is if you haven’t already caught the film. 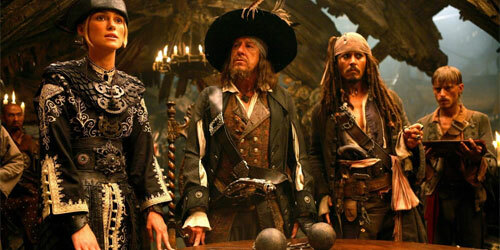 Johnny Depp returns to us as Captain Jack Sparrow in the swashbuckling movie Pirates of the Caribbean: At World’s End. With high adventure, a little bit of humor & a lot of fun, this blockbuster is getting the box office rolling off to a good start. Also in theaters this weekend is Ashley Judd’s Bug. Judd stars as a lonely waitress who becomes paranoid that there are actually bugs crawling under her skin. I have a sneaking feeling that if you’re terrified of insects, this isn’t the one for you!